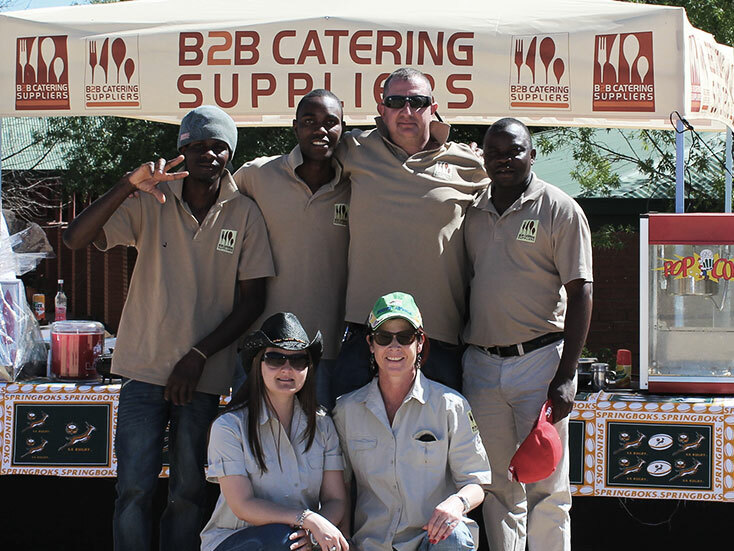 B2B Catering Suppliers started off as a small one (wo)man band by Trish Heyns, with husband Warren in the background, back in 2009. Initially supplying everything catering B2B established a reputation for unbeatable service and excellent, competitive pricing along with innovative sourcing –the ‘if we haven’t got it, we’ll get it’ approach. We take great pride in adding a personal touch to all our interactions with our customers and this is the cornerstone with regards our approach to the tailor made solutions and equipment that we offer. Warren and Trish Heyns, the original business owners have a strong background in service excellence with various positions including commercial catering dealing with a range of challenges from catering for functions to operations. In May 2016 Shaun Kuhn joined them as both a business partner and B2B’s sales manager. Warren, a qualified chef, served his apprenticeship at the Carlton Hotel in Johannesburg and polished his skills with lengthy stints both locally and abroad (at Prue Leith, Waldorf Hotel amongst others) before joining the Compass Group SA only to leave in 2008 to start B2B Catering Suppliers. Shaun has over 17 year’s experience in the Catering Equipment industry having worked for one of the largest catering Equipment suppliers in South Africa, where he was exposed to and learnt about Warehousing, Operations and importantly Sales. He has extensive product knowledge and is a specialist in the retail markets concerning Deli’s, Butcheries and Bakeries. Trish maintains a strong grip on the Administrative side of the Business allowing Warren and Shaun to focus on providing their customers with the top class and proactive service that they have become renowned for across a growing list of customers. From early days with just the two of them, business growth has been steady and now the company boasts an annual turnover in the region of R26 Million, a staff complement of 10 (who all have relevant industry experience) and a growing list of happy, contented customers. We supply everything you could want for a Catering Operation. Smalls – glasses, trays, speed pourers, knives, forks, plates , pots and pans and linen to brooms – we do it all. Fixtures – Ovens, Fridges, Dishwashers, Underbars , Gas Burners , Butchery or Bakery– installed by us as well. Design – have a space and want to change it into a fully functional operational kitchen area – waiting for your call. Turnkey operations – we’ll do all of the above – design, build, place, commission, source and supply ALL of your requirements to help you start a successful catering venture. Repairs – and if it goes wrong we can fix it for you. And if we can we will provide a replacement whilst yours is being sorted to make sure you don’t lose out! Doesn’t matter who or where you are – Blue Chip Companies , Mining, Hospitals and Hostels, Schools and Tertiary ,High Street Restaurants and even tuckshops, if your business is in catering we want to be your Business Partner!